I love a good cookie, but I also equally and maybe even a little more, love instant satisfaction. With these chocolate chip cookie dough bites you get to skip the baking and get right to the face stuffing to revel in the salty-sweet, nutty goodness. 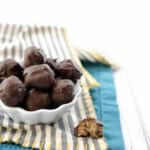 They are slathered in chocolate and velvety rich, especially if you use a silky dark chocolate. 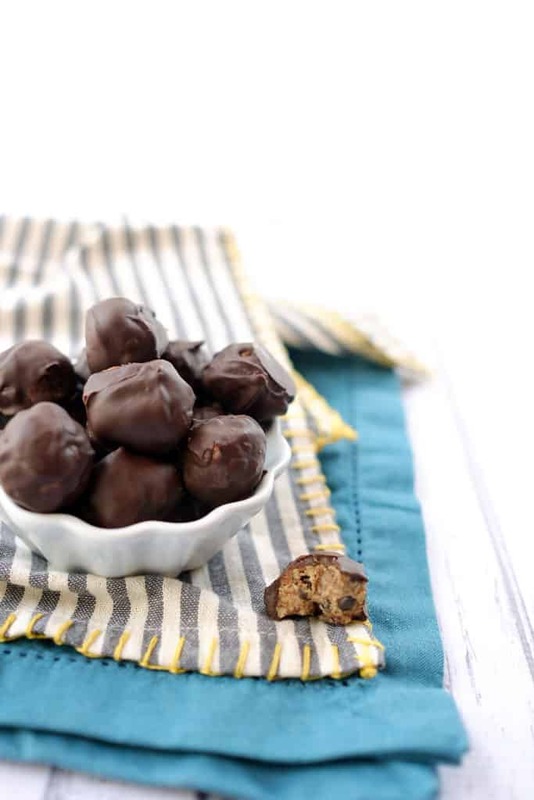 Once you have made a batch, enjoy a couple bites, and then toss the rest in an airtight container in the fridge or freezer. They make great one-bite treats when you need a little pick me up! Try these chocolate chip cookie dough bites out next time you’re looking for a sweet treat. Let us know what you think by commenting below. Take a picture and tag us on Instagram @realsimplegood so we can check it out! Place all of the cookie dough ingredients, except for the chocolate chips, in a mixing bowl. Use a spoon to combine all the ingredients. Once everything is combined you will have a texture similar to regular chocolate chip cookie dough. Next, roll the dough into balls, and place them on a parchment lined baking sheet. Once you are done rolling, place the baking sheet in the freezer while you melt the chocolate chips for the coating. Melt your chocolate chips either using a double boiler (or sauce pan and stainless steel bowl) or in a microwave safe bowl in the microwave. 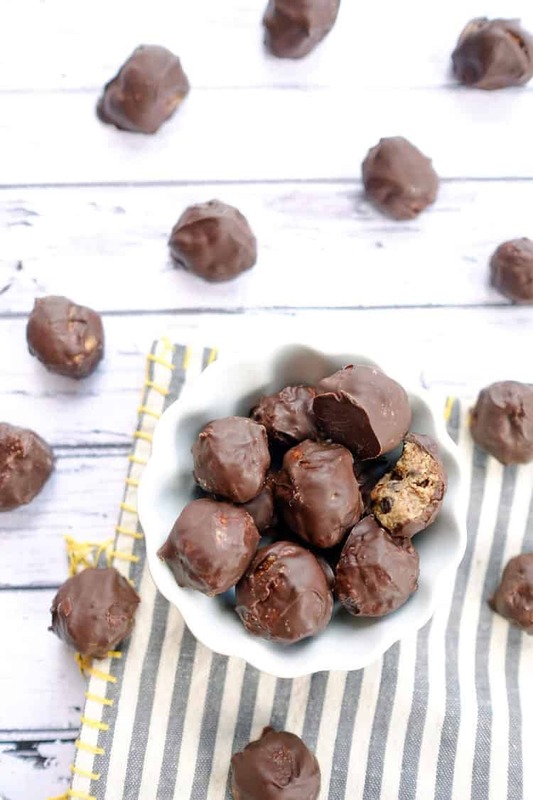 Once the chocolate chips are melted, remove your chocolate chip cookie dough bites from the freezer and one at a time place them in the chocolate coating, rolling them around with a spoon until they are slathered. 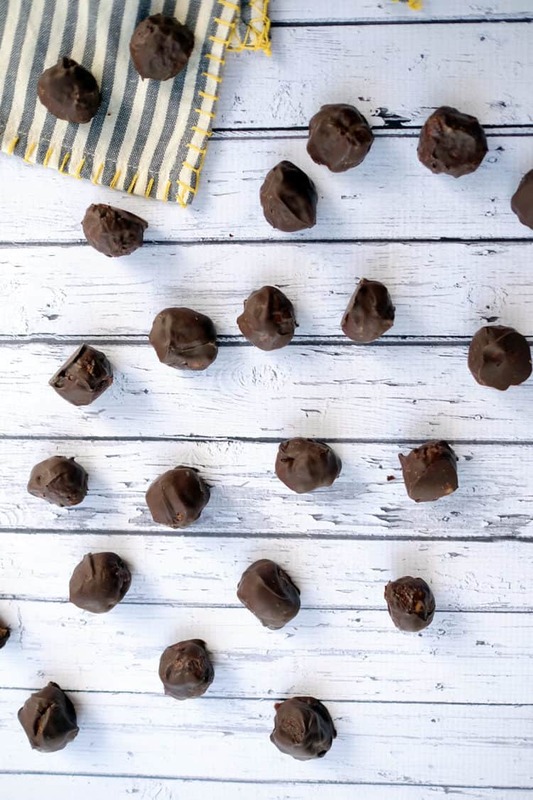 Return the chocolate-coated bites to the parchment lined baking sheet. Once all of the bites are smeared with chocolate, place the baking sheet in the freezer again to set the chocolate coating. It will only take about 5 minutes. Remove from the freezer and savor your labor. Store in an airtight container in the fridge for about a week or longer in the freezer.